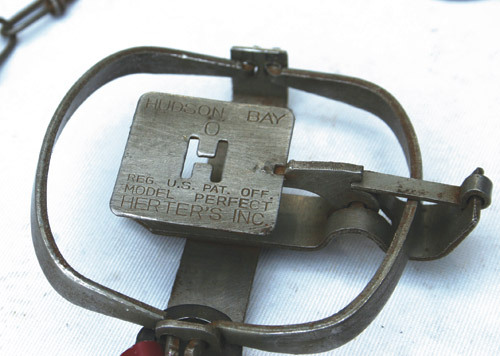 Herter’s, Inc., Waseca, Minnesota, entered the trap-making business in the early 1960s with a reproduction bear trap called the Hudson Bay No. 41 AX Kodiak Bear Trap. To the collector, there are seven versions with varied pan markings and other small differences. The trap was made in the United States, except for one version made in Japan, which is quite rare. Herter’s was established in 1893, and much like Cabela’s today, the company once boasted of being the world source for hunters, fishermen, trappers, guides, gunsmiths, tackle makers, forest rangers and outdoor explorers. Herter’s began offering smaller foothold traps in their 1967 catalog. First were No. 0, 1 and 1-1/2 longsprings with hump crosses, both round and square pans. No. 1-1/2 and 2 coilsprings were also offered, plus three sizes of bodygrip. By 1968-69, the company had added two stop-loss models to their line of traps, a No. 1-1/4 Magnum longspring and the No. 42 double jaw. They also added a “parabolic” (as they called it) jump trap in sizes No. 1 and 1-1/2. Herter’s discontinued the No. 0 and the No. 1-1/4 mangnum longsprings in 1970 because of slow sales. In 1973, they began selling a No. 121 beaver trap, both in single and double longspring models. For 1974, Herter’s offered the No. 87 Custom Deer Trap. The name apparently was a joke, because the trap was the size of a No. 2 double longspring and most certainly wouldn’t have held a deer. In 1975, the company produced a very few No. 4 offset jaw, double coilsprings for the U.S. Fish and Wildlife Service. These traps are marked U.S. Govt. on the pan and are very sought after by avid collectors of Herter’s traps. 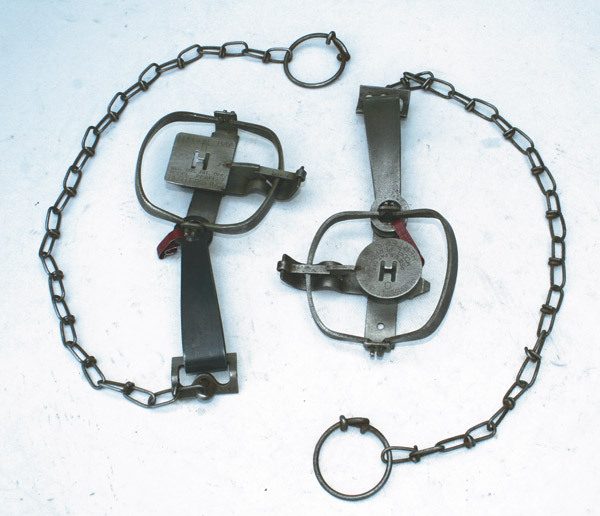 The company made three sizes of Conibear-style bodygrip trap, which they called Body Grip Killers. The bodygrips were numbered 10, 20 and 30. The first model (1967) had a hinge trigger, the second model (1972) was almost identical to Conibears of the day but with Herter’s stamped on the dog, and the third model (1974) had a single wire trigger attached directly to the dog. An “H” was cut out of the pan of almost every Herter’s foothold, including the No. 41 AX Bear trap. But the No. 121 Beaver trap had a solid pan with raised lettering, and the No. 87 Custom Deer trap also had a solid pan. Herter’s also sold a line of wire fur stretchers, a pocket gopher trap, a snare, and trapping scents. During the 12 years the company offered its line of small traps, all but the No. 121 Beaver was built in Japan, and on the bottom base of each trap there is a code that signifies the trap was made in Japan, for Herter’s, and the year (Japan H-67 to H-78). Some of the earliest only have Japan stamped on the the base. By 1979, Herter’s had stopped making traps. On the collector market, a No. 41 AX Kodiak Bear Trap in good condition goes for around $550, a No. 0 longspring brings $100, a U.S. Gov No. 4 around $200, and a No. 121 brings about $100. Most other Herter’s traps are worth about what similar usable traps bring at swap meets. I would like to thank Bob White of Wisconsin for his help in researching the Herter’s line of traps.